Last Thursday I had the exciting opportunity to meet with Professor Nicholas Negroponte and talk with him about the Architecture Machine Group. Nicholas Negroponte’s early work has long been central in my research. 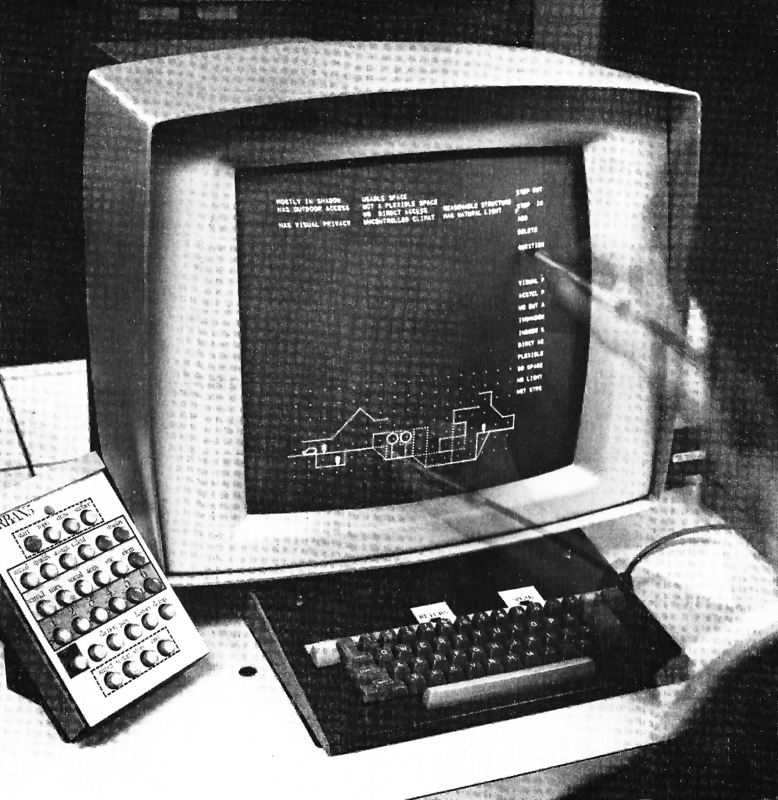 His 1975 book, Soft Architecture Machines, was the first explicit reference to the idea, means and methods of computer aided participatory design. I have always been fascinated by the way this text fused the technological imaginaries of the time (Artificial Intelligence), with radical programmatic architectural diagrams (Yona Friedman), principles from vernacular architecture and ongoing research at MIT (conversation theory, technologies for learning, sketch recognition and representation) to problematize the role of computation in design and to construct a new coherent diagram of the design process, actively destabilizing the roles of its actors. Taking as a point of departure indigenous architecture Negroponte identifies the existence of local conditions within unifying global forces as the alphabet of the vernacular language. Following this concept of a global “objective” system that allows for local intuitive solutions, negroponte proposes a framework of a resilient building and information technology and introduces a new type of personalized architecture machine, a “design Amplifier” that constitutes the interface between the infrastructure and the user’s ever changing needs. I interviewed Professor Negroponte about the importance of participatory design in his research, his relation with Yona Friedman, his thoughts on prospective thinking and architecture and his attitude about the revisiting of these ideas under the light of current technological advances and the spread of open source culture. Nicholas Negroponte’s first reaction to my question on his early studies in computer aided participatory design was that these ideas never really went anywhere and were soon abandoned. Interestingly, Professor Negroponte denoted that the closest the concepts discussed in Soft Architecture Machines came to realization was the SEEK project shown at the New York City Jewish museum in 1970. The SEEK project, also known as Blockworld, was a provocative part of the exhibition “SOFTWARE. Information technology: its new meaning for art”, curated by Jack Burnam. The exhibit consisted of a small group of Mongolian desert gerbils, which were placed in an environment of plexiglass blocks constantly rearranged by a robotic arm. 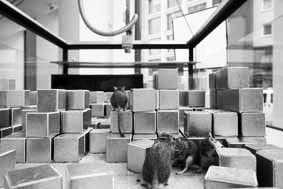 The basic concept was that the mechanism would observe the interaction of the gerbils with their habitat (the blocks), and would gradually “learn” their “living preferences” by observing their behavior. This machine was conceived as both a “cybernetic world model” and a “behaviourist laboratory for observation and experimentation”. I found the placement of SEEK and Soft Architecture Machines in such close proximity very intriguing. In a first reaction, it is rather counterintuitive to link the unmediated expression of user desires via a soft, “informed” machine, with the derivation of behavior rules for rodents rearranging their environment. However, a closer reading of this comment leads to the realization that these two projects intersect when it comes to the role of the machine; the fascination with the prospect of implementing a system which can observe, learn and anticipate behavior individual’s surrogate, their problem worrying partner, able to predict their behavior and reconcile the local with the global. What is unique in the case of Soft Architecture machines is that they are the result of a cross-fertilization of the visions of the golden age of Artificial Intelligence at MIT and the vibrant ideas of Cybernetics, with european influences, namely the work of the “eccentric” Yona Friedman and Gordon Pask. Professor Negroponte spoke about his close acquaintance with Yona Friedman and his wife, who he met during one of their stays in the United States. At that time Yona Friedman had already written the “Towards a scientific Architecture” and had set out the idea of the FLATWRITER, as a self planning tool which combined user participation with behavioral self reflection. To use Negroponte’s word, the diagrams that Yona Friedman was trying at the time “were sufficiently computational” as to provide a basis for implementation. It seems that at the time Friedman’s systematic thinking and his discussion on the democratization of architecture through technology met one of the fundamental principles which have consistently characterized Nicholas Negroponte’s work since its early days to the current era. It was refreshing to hear Professor Negroponte’s enduring technological optimism. Although his later work at the Media Lab and his devotion to the One Laptop Per Child campaign, made the Architecture Machine a fascinated episode of the cybernetic era, clearly however demarcated in the past, Nicholas Negroponte confessed that it was at that time that he wrote the best line he had ever written. This line was the subtitle of the 1970 Architecture Machine book, a vision and a manifesto at the same time. “The Architecture Machine: Toward a more Human Environment”. Negroponte’s technological humanism, his deep belief that machines make us more human and his life long devotion in the development of visual and technological literacy made him very receptive to ideas which were stemming from political and social movements around Europe and advocated for collective ownership of information and information processing and the participation of users in decision making processes. Nicholas Negroponte’s early work, as a visionary fusion of affine elements drawn from different areas and disciplines, under the overarching principle of technological optimism produced a very powerful construct, a new diagram of the role of the user, the architect and the technological platform in the handling of the tension between the individual and the collective, the local and the global, the way in which design is conceived and realized. In that sense, although the idea of computer aided participatory design was left in the shelves, it produced multiple offsprings; from intelligent environments to contemporary paradigms of user driven design, to current conceptions of technology mediated participatory design. Establishing these links and tracing affinities and disparities in their fundamental principles, their assumptions and the tools that they employ is a very suggestive uncharted territory.